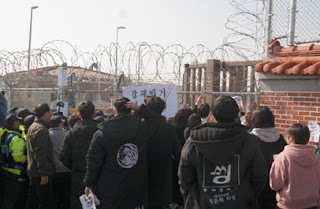 Rallies took place in Seoul to mark the 89th anniversary of Gwangju student uprising occurred on November 3, 1929 against Japan’s occupation of Korea. 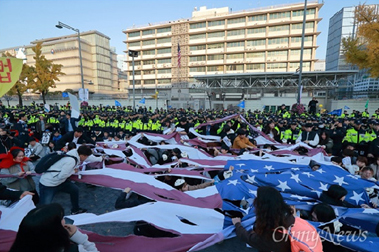 A rally was held outside the US embassy in Seoul on Nov. 3 with attendance of 800 students under the sponsorship of the Solidarity for People's Sovereignty. Today is the day of great turn that the Korean nation is advancing toward the independent reunification, now the supreme patriotism is the anti-US action, the US is the enemy of peace, prosperity and reunification of the Korean Peninsula, the anti-US action is the patriotic work for making a new era, the sponsor of the rally said. He called for the people to kindle torch against the US in the spirit of the candlelight resistance that ousted the anti-reunification elements. They should respect the April 27 and the September 19 declarations agreed by the leaders of the south and the north of Korea, Lee Yang-jin from the Korean Confederation of Trade Unions noted. He called upon the people to intensify the action to abolish the lopsided south Korea-US mutual defense pact, retrieval of the wartime operation control with no strings attached and the withdrawal of the US army from south Korea through declaration of war-end and settlement of peace in the Korean Peninsula. They demanded the US noninterference in south-north relations, dismantlement of the south Korea-US alliance, lift of sanctions against north Korea and pullout of the US forces out of south Korea, while tearing the Stars and Stripes to pieces. On the same day, the students under the Progressive Federation of University Students of south Korea held a rally outside the US military base in Pyeongtaek to demand apology from nominator of the US forces commander in south Korea and the withdrawal of the US troops from south Korea.